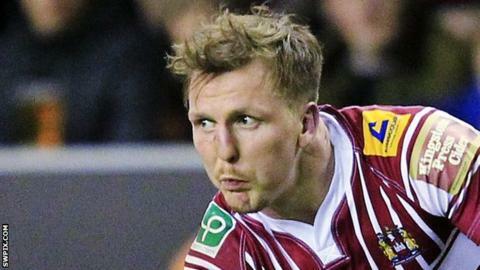 Wigan Warriors have re-signed Dan Sarginson on a two-year deal after his release from National Rugby League (NRL) side Gold Coast Titans. The England international, 24, scored 26 tries in 82 games during three years with Wigan and helped them to victory in the 2016 Super League Grand Final. Sarginson joined Gold Coast on a two-year contract but had an injury-plagued 2017 NRL season. "I can't wait to get back to the club I have many fond memories with," he said. "Although it didn't work out the way I would have liked due to injuries, I'm glad to have had the experience of playing the in NRL. "I'm really looking forward to getting back amongst it with the boys and to the new season ahead." The centre made just five appearances for Gold Coast and his season was cut short in May after he sustained a shoulder injury. "Dan joined us as a youngster in 2014 who was relatively new to the game and left us as a Grand Final winner and an England international," head coach Shaun Wane said. "He knows what we're all about and having spoken with him recently I know just how keen he is to play regularly, compete for honours and get started with pre-season training."